Self Portrait - Trois Crayons - 24"x36"
Lorenzo: born 1954 in Bucharest, Romania. As a teenager, initially infatuated with Beatles, Dali, Jimmy Hendricks and Van Gogh's type of life and philosophy, Lorenzo capitalized on religious art as a way of political nonconformity. He learned about the art of painting icons, about the lives of the Christian saints, the way they were looking like and the most conventional way they were represented. 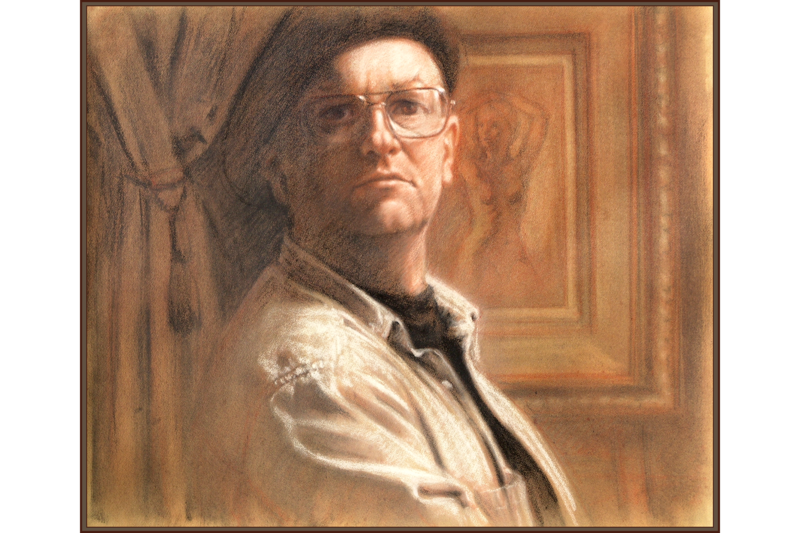 In the same time he experienced and practiced with old painting media like encaustic, egg-tempera and of course, the classic fresco technique. From assisting on scaffolding to all the elaborate phases of studying and applying Old Master iconography and mural techniques, Lorenzo's own "Agony and Ecstasy" stands for posterity on the walls, ceilings and domes of many cathedrals. Studying Greek and Roman art and civilizations opened the doors and lighted the way for discovering the beauty of Italian Renaissance and later French Academy. In mid 80's Lorenzo moved to U.S. Starting as a street portrait artist, Lorenzo build-up his way in society becoming a published and collected well established artist. Lorenzo creates work of art out of his studio in Laguna Hills, California. "The art of drawing should be the primary language for the representational artists."